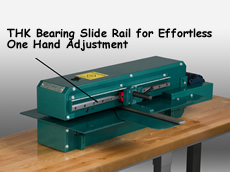 The highlight of these machines is the THK Bearing Slide Rail for effortless one hand adjustments. 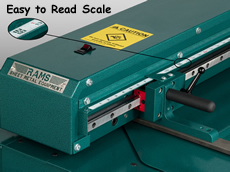 There is also an easy to read scale and an adjustable top cutter, eliminating the need for shims. The unit comes with a 1 HP electric motor, 110-115V single phase. 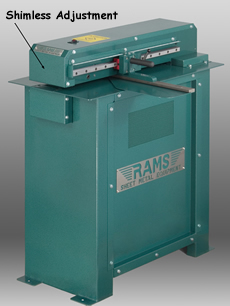 The cabinet is heavy gauge steel with a Hammertone Green Finish. These machines will hold tolerances of +/- .007 over an 8 foot distance. MILD STEEL 16 ga .063"
GALVANIZED SHEET METAL 16 ga .063"
STAINLESS STEEL 18 ga .048"
TRUSS PLATES 16 ga .063"